New poster for the upcoming Chekhov adaptation. 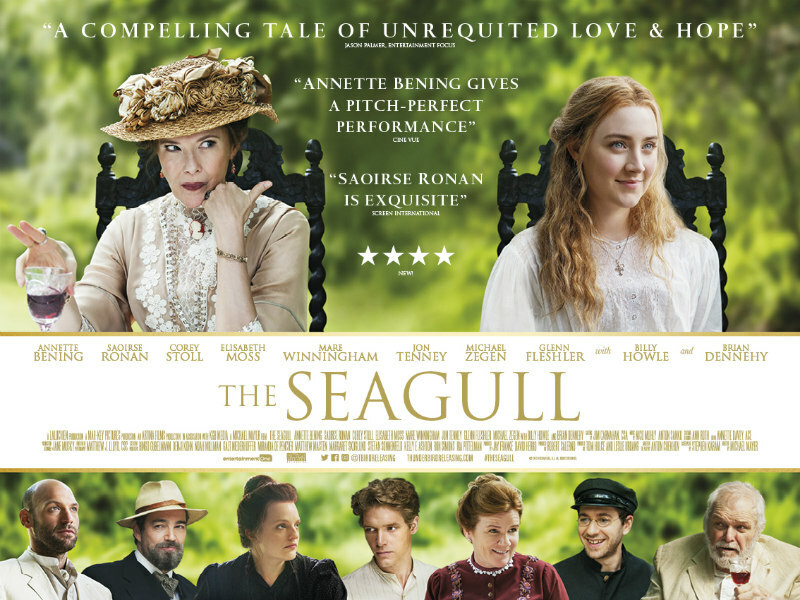 Adapted by director Michael Mayer and screenwriter Stephen Karam from the play by Anton Chekhov, The Seagull stars Saoirse Ronan, Annette Bening, Elizabeth Moss, Brian Dennehy, Billy Howle and Corey Stoll as a group of characters who converge at the estate of an aristocratic actress. The Seagull is in UK cinemas September 7th. You can check out the new UK poster below. Based on the play by Anton Chekhov, the film follows aristocratic actress Irina (ANNETTE BENING, Film Stars Don't Die In Liverpool) as she hosts family and friends with her brother Sorin (BRIAN DENNEHY, First Blood) and her son Konstantin (BILLY HOWLE, On Chesil Beach) at their lakeside estate. When Irina's lover, the successful novelist Boris Trigorin (COREY STOLL, House of Cards) accompanies her one year, Nina (SAOIRSE RONAN, Lady Bird), a naïve girl who lives on a neighbouring estate falls in love with Boris. He basks in her adulation, while Masha (ELISABETH MOSS, The Handmaid's Tale) is obsessed with Konstantin, who loves Nina.